OK so today's activity was thwarted by a broken oven (all will become apparent soon!) Let's just consider this post as part 1 shall we?? 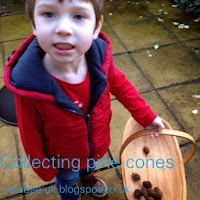 We spent some time out in the garden today collecting pine cones to make into decorations for our new Christmas tree. 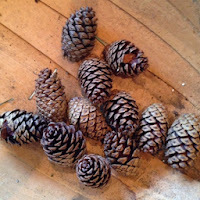 We're fortunate enough to have a small pine in the garden and so out we went and collected up the ones which had fallen, this is a great activity whether you have a tree in your garden or not! Our intention was to dry these in the oven and then do a craft with them, but as this couldn't happen we'll leave this post here and give you another when the oven is fixed! What a shame that your oven's broken at this time of year, I hope you can get it sorted before Christmas! Did you try drying your pine cones in the airing cupboard? May take a little longer but would still enable you to finish your craft. You son looks like he's enjoying his outdoors time collecting the pine cones and I look forward to seeing your craft once you've managed to dry the pine cones out. Thanks for linking up with Country Kids.